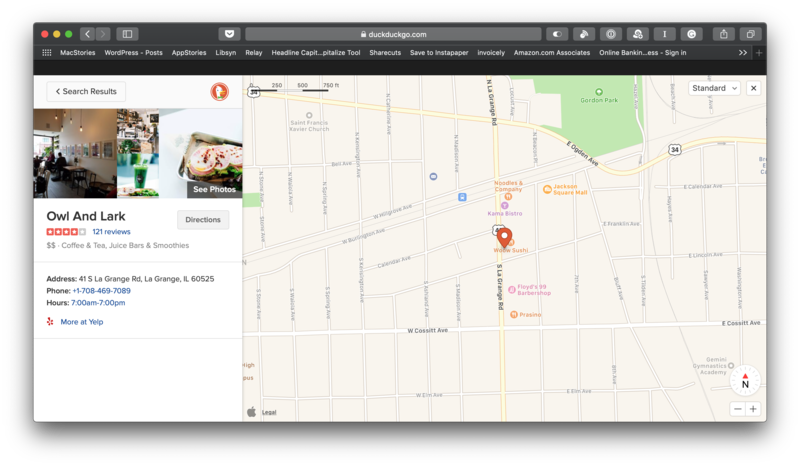 Today, DuckDuckGo, the privacy-focused web search engine, began using Apple Maps for location-based searches. The company, which previously used OpenStreetMap, switched to Apple's MapKit JS framework, which Apple introduced at WWDC in June 2018. General search results and DuckDuckGo's Maps tab both embed Apple Maps' familiar UI with options to display street, satellite, and hybrid views of locations combined with Yelp data for businesses and other destinations. According to DuckDuckGo, users can search by address, geographical place, business name and type, and nearby. Clicking or tapping on the map preview in search results expands the map while selecting a location highlights it on the map. DuckDuckGo explains elsewhere on its site that it uses GEO::IP lookup to determine users' location by default. For better results, users can grant DuckDuckGo permission to use their browser location data, in which case DuckDuckGo says searches are still anonymous because the company does not store location data on its servers. I tried DuckDuckGo's new Apple Maps integration with several different searches. The search engine had no problem finding the coffee shop I was at this morning, and the familiar Apple Maps UI is a definite plus. However, the results weren't as good when I ran a few 'near me' searches. Searches for coffee, pizza, and barbers 'near me' all returned better results before I granted DuckDuckGo access to my location. Of course, these are just a few non-scientific searches from one location, so your results may be different.